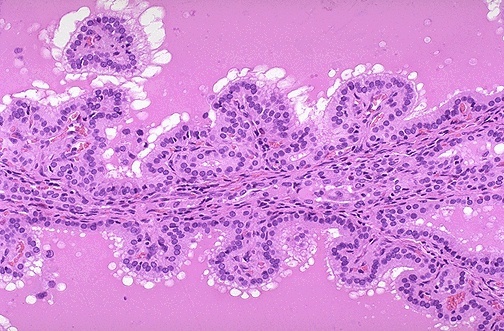 Shown at high power, the tall columnar thyroid epithelium with Graves disease lines the hyperplastic infoldings into the colloid. Note the clear vacuoles in the colloid next to the epithelium where the increased activity of the epithelium to produce increased thyroid hormone has led to scalloping out of the colloid in the follicle. Hyperthyroidism is most often due to thyroid gland hyperfunction (primary hyperthyroidism) best diagnosed with measurement of T4, which will be high, when thyroid stimulatng hormone (TSH) is low. Measurement of T3 is rarely of value except when there is evidence of hyperthyroidism and the T4 is not high.